And the quick scan of Bloomberg’s tool for measuring news trends shows FOMO in the stock market may not be limited to Spring Break. We’ve written exhaustively on the superlatives related to the first quarter’s performance, but that was with participation from most of the 11 sectors in the S&P 500. The rising tide is no longer lifting all boats, with the health care index now flirting with unchanged on the year as the benchmark broadly flirts with all-time highs. We knew health care was going to be a focus with JNJ and UNH results, but the shock was in how managed care, hospitals and the much better performing life sciences names sold off as the “Medicare-for-all” fears started to spread after being localized in managed care for most of the past few weeks. Jefferies acknowledges the fears are real, but notes that the concerns over HCA have led its stock to be “oversold” after falling the most in 2.5 years Tuesday. But with that kind of rotation out of healthcare (and rate sensitive names as the 10-year yield has recovered) as tech and discretionary names lead, there has been alpha on the table despite what appears to be a snail’s pace higher in recent days. 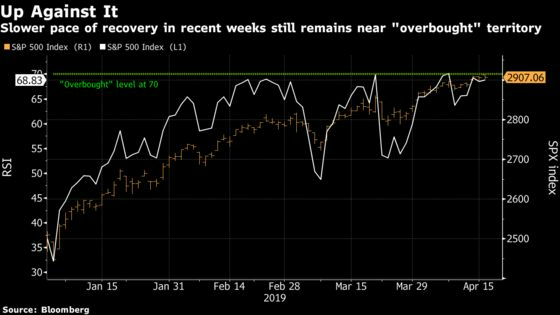 In last week’s Taking Stock column, we covered the incremental moves (there’s been just one day this quarter where we’ve seen a 1% move or more in either direction). But don’t be fooled or lured into complacency. The relative strength index has been hovering near 70 for the entirety of April, suggesting near so-called overbought levels. Canaccord analysts, for their part, note their tactical indicators "continue to be near an extreme." 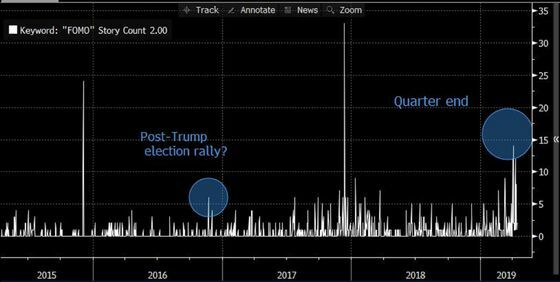 Other strategists like Jefferies’ Darby highlight the "grinding" rally has been among the "most unloved" in recent history and sees a potential risk for the "melt-up" to continue. MKM technical strategists have agreed, raising the prospect for risks near old highs but noting the technical strength is “powerful enough” to keep the market moving up. S&P futures are up just 6 handles, so it seems that snail’s pace is on track. If you’ve been invested its hard to complain, but what many seem to be discussing is that hedge funds and others have been “stuck” in cash for some time. 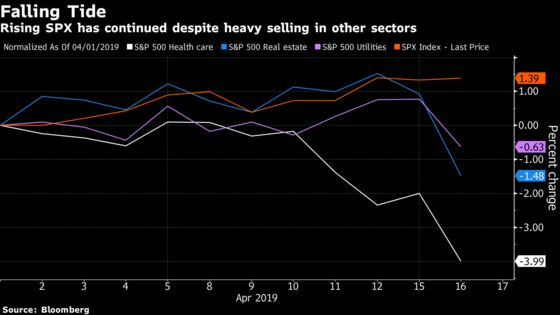 BlackRock’s CEO Tuesday in an interview post earnings said as much; “there are huge pools of money sitting on the sidelines,” in his description about how investors have yet to rush back into equities. So with that in mind, and with global risk assets getting fresh bids Tuesday, it will be curious to see where this money flows. It’s a mixed bag early after competing narratives on growth from China and Germany (the former exceeded growth estimates for GDP and the latter cut its growth forecast for 2019). Two major constituents of two of some of the best performing sectors (IBM is the 9th-heaviest weighted stock in S5INFT; NFLX is the 8th-heaviest weighted name in S5TELS) did disappoint (bulls, but not neutral options strategy participants) with muted results overnight. And though we thought that was going to be the biggest news in tech land, we were wrong. Netflix, though missing on some key forecasts for streaming subscribers and revenue, appears to be quite a force to be reckoned with, going as far as to say two of the most powerful companies in media (Apple, Disney) will not materially affect its growth. What a long way its come from once being dependent on studios for nearly all content. Shares are down a touch here early but analysts broadly felt the picture was unchanged. Keybanc noted there was "limited upside" to near term subscribers despite its impressive revenue growth. Cowen, despite being outperform rated, kept its PT unchanged citing the original content ramp in 2019 that is expected to help subscriber growth that, for the U.S. at least, missed their expectations. And BMO, which has NFLX as its Top Pick, wrote that "a largely unchanged view is deserved." Safe to say there’s no blockbuster in these results. And for big blue, cloud revenue growth slowed, which only raises the stakes for the Red Hat acquisition to unfold smoothly and supplement their hybrid cloud strategy. Shares are having a rougher time than Netflix, down nearly 4%, but that’s expected after missing analyst estimates. Some on the Street attributed the miss to weakness in the Asia-Pacific region but remain broadly supportive of the strategic moves the company is taking. Ultimately these results failed to move the needle in any direction, with few analysts even tweaking estimates, much less price targets. Citi may have summarized it best in their note, writing that there is “something for everyone to debate” while keeping their neutral view on the stock unchanged. Grocery names (KR, SFM, NGVC, UNFI) after Smart & Final entered a deal to be acquired by Apollo, just one month after plunging the most ever after results. The deal at $6.50 equates to a share price seen in early March. Managed care, hospitals, life sciences stocks after S5HLTH plummeted on Tuesday over the Medicare-for- all concerns. The firm sees more growth potential in Domino’s Pizza, which it lifted to overweight, saying the Street wasn’t recognizing the company’s prospects. Shares are "pricing in 2-3% blended global same store sales over the next two years (vs 5-6% over the last two years), which we view as too bearish based on history for a best in class operator," wrote analyst John Glass, who also led the CMG call. He added that concerns over DPZ’s U.S. trends “may be overdone,” pointing to data about Domino’s app downloads in the first quarter.